Head teachers say England’s schools face a £5.7bn funding shortfall. Without an injection of extra cash, head teachers’ leaders say many schools will have to make “deeper cuts” or “face insolvency”. The funding warnings were made at the annual conference of the Association of School and College Leaders. Education Secretary Damian Hinds told the conference he heard the message on school funding problems “loud and clear”. Speaking to the head teachers’ conference in Birmingham, Mr Hinds said he realised that schools were under financial pressure and faced “hard choices”. He promised that he would be “doggedly determined” and make the “strongest possible case” to the Treasury in the next spending review. Mr Hinds, who received polite applause at the end of his speech, said he would “back heads to have the resources they need”. He said he “totally recognised the pressure on schools”. The ASCL head teachers’ union has calculated how much it believes schools need to solve their funding shortfalls. The heads say there is a £5.7bn shortfall in per-pupil funding for 2019-20, which they argue should rise as an allocation to schools of £40.2bn. Head teachers campaigning over funding shortages have pointed to the evidence of the Institute for Fiscal Studies, which has said that per-pupil funding has fallen by 8% since 2010. They say schools have to cut staff, increase class sizes and stop teaching some subjects. There have been warnings of schools closing for a half-day on Friday to save money. The union’s president, Richard Sheriff, said the analysis of what schools needed was to make sure the debate on funding was “informed by evidence” rather than “rhetoric”. Last week a grassroots head teachers’ campaign over funding had accused Mr Hinds of “snubbing” a request for a meeting. But he told the heads at the conference that he met teachers in schools “week in and week out” and heard their concerns about funding. 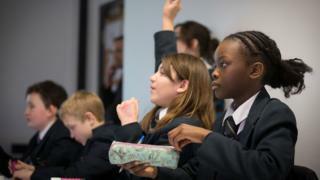 The head teachers’ union also heard warnings that schools were having to “pick up the pieces” for families in poverty. Heads warned that schools were having to act as an “unofficial emergency service”, providing food and clean clothes for pupils from impoverished families. But they say that such extra welfare support is unaffordable when schools are facing cuts. Mr Hinds also addressed concerns over staff shortages – and spoke of the need to reduce the number of teachers leaving their jobs. He said 33% of new teachers left the profession within five years. The education secretary announced plans for an expert advisory group to help teachers with “the pressures of the job”. The advisory group, including the mental health charity Mind, will look at ways to improve wellbeing among teachers and tackle stress.